2005-08-05. Good. Ships with Tracking Number! INTERNATIONAL WORLDWIDE Shipping available. May not contain Access Codes or Supplements. May be ex-library. Shipping & Handling by region. Buy with confidence, excellent customer service! Williamson School of Horsemanship, 1968. Hardcover. Very Good. Disclaimer:A copy that has been read, but remains in excellent condition. Pages are intact and are not marred by notes or highlighting, but may contain a neat previous owner name. The spine remains undamaged. At ThriftBooks, our motto is: Read More, Spend Less.Dust jacket in good condition. Fifth printing. SIGNED and inscribed by the author. Minor shelf and handling wear, overall a clean solid copy with minimal signs of use. Tear in back of dust jacket. Some creases along spine. Previous owner's gift inscription underneath author's inscription. Binding is sound. Pages are intact and free of marks. 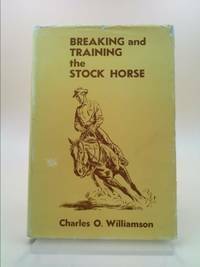 An invaluable tool in the training and breaking of the horse, written by world renowned horse trailner Charles Williamson, this book comes to you wrapped in a protective mylar jacket to ensure enjoyment for many years to come. Secure packaging for safe delivery.Dust jacket quality is not guaranteed. Caxton Printers, Ltd.. Very Good- in Good+ dust jacket. 1968. Sixth Edition. Hardcover. 0960014411 . Dustjacket is tattered, torn and sunned. Former owner's name on ffep. Former owner's underlinings and markings in first few pages of text. Boards edgeworn. ; 0.9 x 10.1 x 6.9 Inches; 125 pages . Williamson School of Horsemanship, 1968. First Edition. Hardcover. Very Good. Disclaimer:A copy that has been read, but remains in excellent condition. Pages are intact and are not marred by notes or highlighting, but may contain a neat previous owner name. The spine remains undamaged. At ThriftBooks, our motto is: Read More, Spend Less.Dust jacket in good condition. SIGNED by the author. Minor shelf and handling wear, overall a clean solid copy with minimal signs of use. Signed by author on title page. First Edition, with no additional printings indicated. Dust jacket now wrapped with protective mylar cover. Chipping and tearing to edges of dust jacket. Previous owner's bookplate on front endpaper. Secure packaging for safe delivery.Dust jacket quality is not guaranteed. Hamilton, Montana: Charles O. Williamson, 1962. Author has signed on dotted line on title page where Fourth Edition by is printed. Spine of dust jacket is faded to lighter yellow, 1" tear on top rear spine corner fold, 2 1/2" tear from bottom front corner, 1" tear on top front panel edge, edge chips and 1/2" tear on heel of spine of d/j. Tan cloth with brown lettering on spine and front cover. 121 pages.. Fourth Edition. Hard Cover. Near Fine/Good. Illus. by Sketches By Carl Hoobing . 4to - - 10 1/4" Tall. Caldwell, ID: The Caxton Printers, Ltd, 1958. Cloth. Carl Hoobing (sketches). Octavo (7¾" - 9¾" tall). 121pp. No nosense approach to horsemanship. Bound in light yellow cloth boards, with yellow, illustrated dust jacket (1/2" and 1" chipping to corners, spine faded). Inscribed and signed by author, and subsequently inscribed by recipient to 3rd party. Very Good/Good. The Caxton Printers. Hardcover. 0960014411 New Condition. . New. Caldwell, ID Caxton Printers, January 1965. Hardcover Hardcover. Good/Fair. Small tears in dust jacket. Edge and corner wear to dust jacket. Creases to dust jacket. Dust jacket is in good condition. Edge and corner wear to book. Remainder mark. Pages still clean and tight. Book is in good condition. All orders shipped with tracking number and e-mail confirmation. All Orders Shipped With Tracking And Delivery Confirmation Numbers. The Caxton Printers. Hardcover. 0960014411 Like New Condition. . Fine. Caldwell, ID: Caxton Printers. Very Good in Good dust jacket. 1965. Hardcover. In chipped/slightly faded DJ; Signed/inscr by author. Gray cloth hardback. Drawings; 8vo; xiv + 123 pages; Signed by Author . Chadwell ID: Canton, 1962 Book has name in ink on top edge of FFEP. DJ Fine. 121pp. Illustrated in B&W by Carl Hoobing. Stated 4th Ed. Tight, bright, square copy. No remainder mark. No internal markings. Crisp, unclipped DJ in Mylar cover. Signed by author on Title Page.. By Author. 4th Edition. Cloth. Almost Fine/Fine. Illus. by Illus in b&w. 4to - over 9¾" - 12" tall. Horses. 1973. Book. Illus. by Hoobing, Carl and Hayes, Sherman. Very Good. Hardcover. Inscribed by Author(s). 6th Edition. 8vo - over 7¾ - 9¾" tall. tan cloth over boards with brown illustration of man getting off horse after roping a steer, black and white drawings inside, binding edges lightly shows use, spine tan with brown text - office. Caldwell, Idaho: Caxton Printers, 1980. Hardcover. Very Good - Cash. Very little wear to cover, corners, and edges. Binding is tight, pages are unmarked and crisp. Dust jacket in good condition- minor chips and tears along edges. Stock photos may not look exactly like the book. Breaking and Training the Stock Horse. Caldwell, Idaho The Caxton Printers , 1968. Hardcover Sixth edition (1971). First published in 1950. Fine in Very Good DJ: The Book is flawless; the binding is square and secure; the text is clean. Free of any ownership names, dates, addresses, notations, inscriptions, stamps, plates, or labels. A handsome, like-new copy, structurally sound and tighly bound, showing no flaws. Virtually 'As New'. The DJ shows indications of careful use: light wear to the extremities and moderate rubbing to the panels; unclipped. A Like-New book in a moderately used DJ. NOT a Remainder, Book-Club, or Ex-Library. 4to. (10.35 x 7.15 x 0.8 inches). xiv, 125 pages. Illustrated with duotone sketches by Carl Hoobing. Tan buckram over boards with brown titles and designs at the front panel and brown titles at the backstrip. Language: English. Weight: 1 pound, 6.8 ounces. Sixth edition (1971). First published in 1950. Hardback with DJ. Edition: Sixth edition (1971). First published in 1950. The Caxton Printers,LTD. B002VYSFG4 Signed & flatly inscribed by author on title page, 1965 Caxton hardcover, Good+/NO DJ, missing dustjacket, tan covers with lettering & decor as shown on amazon that all reads perfect, just a touch of soiling, text contains a light amount of mostly neat underling, name & address on endpaper, sound binding. ...Package carefully to protect the corners. . Good. 1973-01-01. 1973. U.S.A.: The Caxton Printers, 1968 hardback book is fair condition,book and first blank page have damp-stain,first few pages have slight waviness,dust jacket is near fine,6th edition. 5th or later Edition. Hardcover. Fair/Near Fine. New Plymouth, ID/Caldwell, ID: Charles O. Williamson/Caxton Printers, 1950. 89pp. ; HB lt.brwn.w/brwn. ; rubbed w/stains; tanning on endpapers w/clean,tight pgs. "Read and re-read these instructions. As with any set of instructions, you will see something each time which you failed to see before." illus. signed. Signed by Author. 1st. Hard Cover. Very Good +/No Jacket. Illus. by Wallis, James & Hoobing, Carl. 4to - over 9¾" - 12" tall. Self-Published. Idaho: Caxton Printers. Dust jacket slight soil and tears, overall good+ condition. CR 1950-1971. Sketches by Carl Hoobing and Sherman Hayes, 125 pages. Author lays down the basic elements of first class mounted horsemanship, applicable in any field of equitation. You will learn how to do it, what to avoid doing, and why.. Sixth Edition. Hard Cover. The Caxton Printers. Hardcover. 0960014411 Contents are tight and clean; No dj . Very Good. U. S. A.: Caxton. Fine +. 1965. Fifth Edition. Cloth Hardback. Signed 123pp black and white illustrations SIGNED, dated, and inscribed to previous owner on title page Covers all aspects of training and breaking horses . Caldwell ID: Caxton Printers. 6th edition. Illustrations by Carl Hoobing and Sherman Hayes. Beige cloth with brown lettering and decoration. Prior owner name/address on endpaper. Jacket is a bit worn and is faded on spine and along top edge. . Very Good. Hardcover. 5th or later Edition. 1968.